Arbovirus (Arthropod Borne Virus) is used to describe infection caused by viruses that spread to people through infected arthropods like mosquitoes, ticks and others. The market study on arbovirus testing provides an in-depth analysis of the global market for arbovirus testing for the period of 2016-2025, therein the base year is 2016 and 2017-2025 is the forecasted period. The research study covers all prevalent trends and opportunities playing a major role in influencing the growth of the global arbovirus testing market during the forecast period. It also highlights various drivers and restraints impacting the market’s growth. The scope of the research covers end user analysis, competitive assessment, regional outlook and various test types of arbovirus testing. In terms of business opportunities, Asia-Pacific and Middle East & Africa are lucrative markets for players involved in arbovirus testing due to high population at risk of infections and owing to high distribution of arbovirus. However, present diagnostics techniques are used only in few infections. Due to advancement of technology, manufacturers are focused to increase the applicability of diagnostics to other infections and it is expected to fuel the growth of the arbovirus testing. 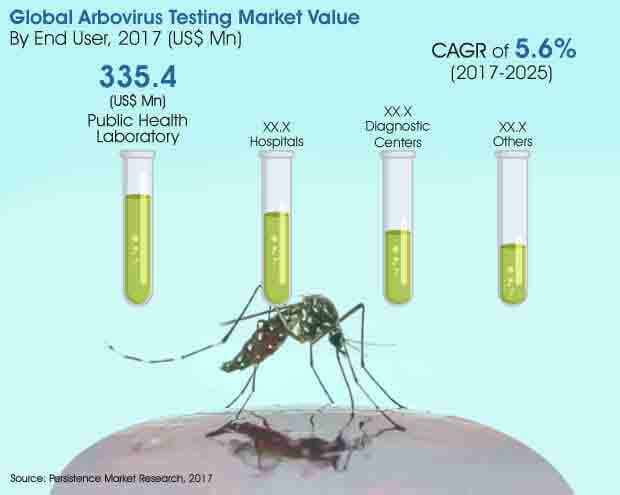 The research report states that the growth of the global arbovirus market is dependent upon factors such as emergence of arboviruses at a high rate, increased public health challenges and integrated government initiatives are pushing the growth of the global arbovirus testing market. The global market for arbovirus testing is estimated to reach around US$ 1500 Mn by the end of the assessment year (2025) from a valuation of about US$ 970 Mn in 2017. The global market is projected to grow at an above moderate CAGR of 5.6% during the period of forecast. Public health laboratories have been carrying out arbovirus testing on a large scale across the globe. The public health laboratory segment in the end user category is the largest in terms of value. The revenue generated by this segment is higher than any other segment and this scenario is likely to continue over the assessment period. The public health laboratory segment is estimated at around US$ 335 Mn in 2017 and is anticipated to reach a valuation of about US$ 540 Mn by the end of the year of assessment (2025). The public health laboratory segment is projected to grow at a value CAGR of 5.6% during the period of forecast. This segment dominates the global market in terms of value and growth rate and thus largely contributes to the growth of the overall arbovirus testing market. Hospitals segment in the end user category is anticipated to show a significant valuation by the end of the year of assessment. This segment is valued at about US$ 315 Mn in 2017 and is estimated to reach a valuation of more than US$ 450 Mn by the end of the assessment year (2025). The hospital segment is expected to grow at a comparatively slow rate and is projected to register a value CAGR of 4.6% during the period of forecast, 2017-2025. This segment is the second largest with respect to value.